Given its subject matter and the fact that it’s the soundtrack to a planetarium show, Stephen Dubois’ 2012: Prophecy of Doom? perhaps understandably runs a bit heavy on theme and bombast in spots. But it’s also got its share of less affected music that treads somewhere between punchy electronica and standard-fare New Age. Dubois calls it “an interpretation of the past with a decidedly modern electronic twist,” and took his musical cue from a documentary that discussed an archeologist finding a mural on a Mayan temple wall that showed an orchestra with flutes, horns and drums. Dubois’ music is evocative enough to carry his story, but I find myself fading in and out of it. He catches me with the Ray Lynch-style vibe of “The Calendar Wheel,” a cool jaunt built on gurgling sequencers and light pads. “Doomsday” also has a nice analog feel, hurrying in on thick bass notes that convey a sense of urgency. Serpentine pads twirl around it, ramping up the sense of pent-up energy awaiting release. A flute flies in to cut the tension and add lightness–a nice touch. “Sunrise on Dec. 22” is a picture-perfect New Age piano piece that nails its theme with a bright melody and light touches of electronics. “A New Era” blends a nice tribal backdrop with flute sounds for an uplifting world feel. Much of the rest of the disc glides by innocuously enough. The misses here aren’t egregious, and they’re probably not misses at all to a listener a bit more in tune with this type of work. The da da daaa symphonics that close out “The Opening” are just a bit presumptuous for me, which I realize sounds a little petty when we’re talking about the start of a presentation on doomsday. The chanting vocals in “The End of the World” and “Shadows in Stone” have me reaching for the “next” button. Thematic, I know; all I can tell you is that without a visual frame of reference to maybe give me better perspective, it’s not a sound I want to hear. By comparison, the lead male voice in “Shadows in Stone” works well. Feels like the officiant in a mass. Dubois adds on three bonus tracks–that is, non-doom-related, called “Constellations of the Zodiac,” and these offer a pleasant-enough, lightweight New Age feel. 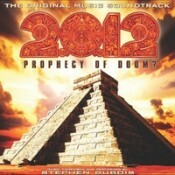 2012: Prophency of Doom? will find an audience with straightforward New Age listeners. Dubois is a talented musician and these pieces are well constructed; I just feel like he’s a bit shackled by the heft of his theme here. Have a listen. Available from Ancient Eyes Music.